In concert with Moving Traditions, a nationally recognized leader in Jewish eduction, Temple Beth El offers two experiential programs for young men and women, respectively: Shevet Achim: The Brotherhood and Rosh Hodesh: It’s a Girl Thing!. 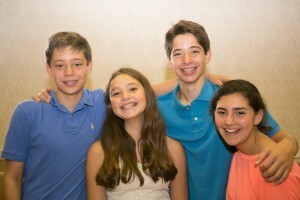 These programs, which meet one evening per month, September through May and include informal “social” time, allow teens in grades 8 and 9 to apply a gender lens and Jewish values to the challenges of their everyday lives. Shevet Achim: The Brotherhood helps teenage boys explore two primary questions: “What does it mean to be a man?” and “What does it mean to be a mensch?”The curriculum, led by a trained group leader, connects Jewish ideas, stories and ethics to the most challenging issues in the lives of teen boys: competition, aggression, power, academic stress, pursuit of pleasure and risk taking. Rosh Hodesh: It’s a Girl Thing! offers a “safe zone” in which a trained adult mentor helps teenage girls explore and discuss many of the core challenges they face in their coming of age as young women, such as body image, relational aggression, over-sexualization and stress. To register your child for one of these programs, please fill out and submit the online registration form. There is a $150 fee for each program. For more information about these programs, contact Lisa Gittelman Udi.